Where the Deer and the Antelope Play | So Many Exciting and Beautiful Places! I wasn’t planning to blog about this short road trip, but found a few interesting things along the way, so here I am. My sister and I are taking our father to visit an Indian school in Montana, then heading south to visit his sister and her husband in Denver. We headed out this morning, driving up to Fargo, then west through North Dakota. We make frequent stops since our biological clocks aren’t in sync. It’s good to get out of the car and move around, so I’m not complaining. The visitor center at Fargo has a woodchipper in front of the building, and another inside with a foot extending up out of it – the “friend in the chipper.” Fans of the Coen Brothers movie, Fargo, will appreciate the reference. 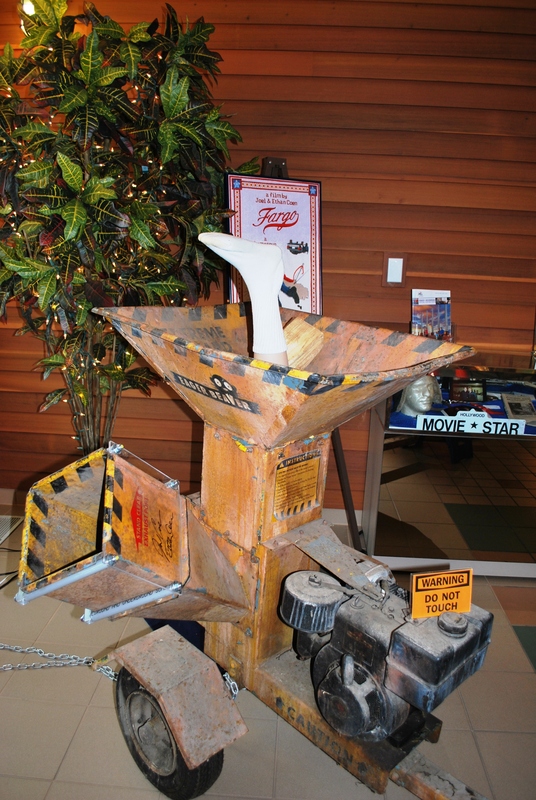 The woodchipper inside is actually an original movie prop. It was purchased by Milo Durban, the Dolly Grip on the set of Fargo, who used it for a few years on his hobby farm in Minnesota. He later put it in storage, and when the Coen Brothers were filming A Serious Man in Minneapolis, he took a portion of the chute to have it signed by them. The Fargo Moorhead Convention and Visitors Bureau borrowed it for a week long tourism event, then purchased it when it proved to be a popular attraction. Oh, the things we learn on the road! My sister saw a sign for a National Buffalo Museum in Jamestown, ND. She’d been there years ago when her children were young, and it seemed like a good place to stretch our legs. Besides a frontier town, Jamestown has the World’s Largest Buffalo Monument. Put in place in 1959, it is 26′ tall, 46′ long and weighs 60 tons. It was constructed with stucco and cement over a steel beam frame shaped with wire mesh. There are several real buffalo roaming nearby as well. In addition to the buffalo, there are the Village Goats, Fred and Ted. The buffalo sculpture stands alongside a Frontier Village with several reconstructed buildings, including a church, a one-room school house, train depot, dentist’s office, bar and other buildings. It was a lovely day to walk through this little village, peek in the buildings, and even examine some of the antiques. We learned that several celebrities hail from Jamestown, the most noted being Louis L’amour and Peggy Lee. Back on the road again, and we decided to try a scenic byway for part of the trip, beginning in the town of Hebron. The byway was gravel road, so we skipped that, but we did visit Fort Sauerkraut, a sod “fort” that had been constructed in the 1880’s when the townspeople feared an attack from some Sioux warriors who had recently escaped from the reservation. Fortunately, the town was not attacked. The original fort, the only sod fort ever built in North Dakota, is long gone. The current replica was constructed in 2004, with the hope that tourists would be drawn to the site. It worked for us! The name apparently stems from the fact that the town’s founders were German. We also saw a couple of the wire sculptures that have been constructed along the Enchanted Highway, which stretches 32 miles from I94 exit 72 to the town of Regent. Local artist Gary Greff conceived the idea in the late 1980’s, as a way to attract people to small towns in the area, hopefully preventing their demise. The sculptures are made from scrap iron and can be seen for quite a ways. There are currently seven sculptures, including Geese in Flight and Deer Crossing which are located close to I94, and an eighth sculpture is under construction. We wished we had come through here earlier in the day so we could view them all. By the way, if you do choose to drive the route, Greff has built a hotel in Regent, called the Enchanted Castle. This entry was posted in North Dakota, Road Trip, USA Travel. Bookmark the permalink.